From Middlepark Heights, OH, Jade attended Midpark High School prior to the University of Notre Dame, where she earned a degree in History, minoring in Business Economics. While competing for the Irish, Jade took home nine USTFCCCA All-American titles and was a consistent qualifier for the NCAA indoor and outdoor championship events, earning a fourth place finish her senior year. During the 2015 outdoor season, Jade set the Notre Dame school record for the 100-meter hurdles with a time of 12.70 during the NCAA semifinal. Track is a family sport for Jade. 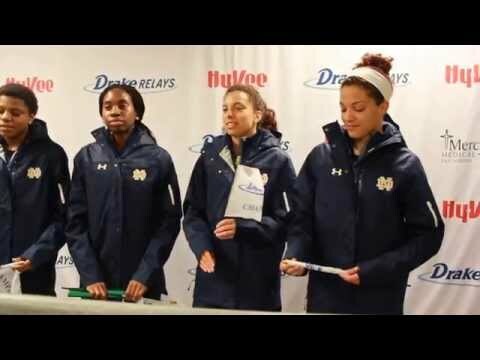 Her twin sister, Kaila, also competes for the Irish, and still has one more year of eligibility. As to her fondness for track, she says, "When I started running I did it because I loved the sport. I continue to run today not just because I love it but because every time I step on the track I feel closer to my father. My father was my biggest fan but he passed away suddenly in 2013. Every time I run I can imagine him in the stands and I want to make him proud." Jade has a soft spot for all animals, noting that, "if I could own as many animals as I wanted my roommates would probably kick me out!" When everything is all said and done, she is more interested in people remembering her for being a good person than for how many victories she has. Jade currently works part-time for Notre Dame and continues to pursue her dreams in South Bend.